Visitors will be invited to send works on US Tour Ninety "Hugs for Heroes" quilts honoring America, her soldiers and Presidents will be on display at the March 21-22, 2009 Great Lakes Seaway Trail Quilt Show at the Seaway Trail Discovery Center in Sackets Harbor, NY. Show visitors will be invited to send their own 22-inch by 22-inch "God Bless America" patriotic theme quilt on a tour of the United States. Judy Howard of Buckboard Quilts of Oklahoma created the patriotic theme quilt tour that is placing the specially-made quilts on display at the Seaway Trail Discovery Center. Two full-size quilts with the exhibit feature the US Army Thunderbirds and President Abraham Lincoln. "These quilts capture the essence of ‘America the Beautiful&apos; by paying tribute to our American heroes and troops," Howard says. 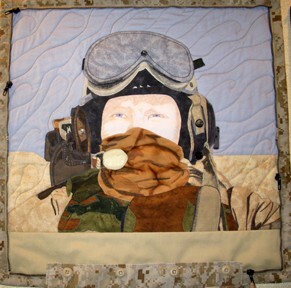 "Some of the quilts have traveled to Camp Striker in Baghdad to bolster the spirits of our troops, and will go to military hospitals and schools to blanket America in stitches of comfort and patriotism." Howard, the author of Heavenly Patchwork I & II, is inviting quilters to enter their 22" quilts in the traveling exhibit by June 30, 2009. Quilts must be mailed to Howard at her Oklahoma City shop. Cash donations accepted at the Hugs for Heroes exhibit at the March 21-22, 2009 Great Lakes Seaway Trail Quilt Show will help the campaign provide quilts for wounded troops and the families of fallen soldiers. The Fort Drum Chapter of Operation Kid Comfort will be at the Seaway Trail show inviting volunteers to take kits to make photo quilts for the children of local soldiers. The Great Lakes Seaway Trail Quilt Show is a Yellow Ribbon Event for military families. Also on Exhibit: Four U.S. and Canadian quilting author-artists - California&apos;s Pat Durbin (Mosaic Picture Quilts); Beth Wheeler and Lori Marquette of Two Sipsters Studio, Fort Wayne, Indiana (Altered Photo Artistry and Threadography®; and Pamela Allen of Kingston, Ontario (Think Like an Artist) are sending their quilts, wallhangings and fabric postcards for display at the March 21-22 show. The Great Lakes Seaway Trail Quilt Show will also feature a display and competition of storyteller quilts and wallhangings featuring "favorite" Seaway Trail public places made by individuals and community quilt groups from across the 518-mile byway that hugs the St. Lawrence River, Lake Ontario, Niagara River and Lake Erie shoreline. Show winners will be selected by show visitors&apos; Viewer&apos;s Choice balloting for $500 in prizes. Rules and entry form are online at www.seawaytrail.com. The Seaway Trail Foundation and the Orleans County Country Barn Quilt Trail are sponsoring this 9th annual Seaway Trail Quilt Show. For more information, go online to www.seawaytrail.com or call 315-646-1000.